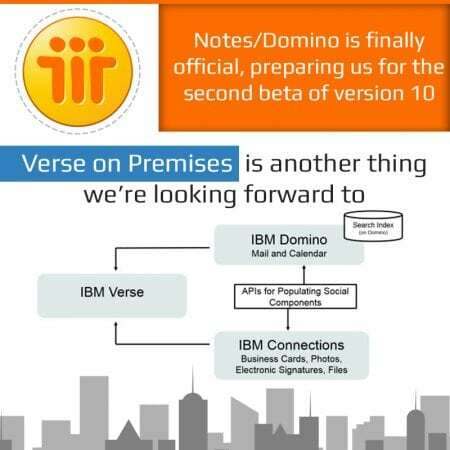 As previously reported, the folks over at IBM are doing their best in an attempt to make the Notes/Domino platform futureproof. In this direction, they are preparing to launch a second beta of the new version, 10, for the upcoming days. For those of you who aren’t familiar with Lotus Notes, it’s mainly an environment for messaging and app development, acquired by IBM for a then-record fee of $3 billion. In the meantime, the original Notes platform was rebranded as Domino, while the actual Notes name was kept for the client. However, as soon as Microsoft’s Outlook was introduced, the enthusiasm around Domino faded. Back to the present days, there is a whole new roadmap now, promising to deliver a new version of Lotus Notes in 2018, as well as another one in 2019. As for the one we’re getting soon, it’s absolutely loaded with goodies! Over the past weeks, the IBM staff toured across Asia, explaining crowds what they should expect from Domino 10, currently available as a closed Beta. And since you’re all looking forward to knowing when it will go live, IBM collaboration executive Mat Newman revealed that a second beta will be available by the end of July 2018. Specifically, this beta will offer the possibility to test Domino (for Windows and Linux), the Notes client (for Windows and Mac), Notes, Designer and Admin clients (for Windows), Verse on Premises (for Windows and Linux) and, finally, the DominoDB NPM package for Node.js. Obviously, the latter is the most important item, considering that one of the main reasons why Lotus Notes didn’t manage to “shine” was because the development environment was pretty much a silo. Therefore, integrating Node.js will transform it and give users the possibility to come up with more modern and portable apps. Verse on Premises is another thing we’re looking forward to, as it’s considered IBM’s attempt at creating a new and sleek collaboration tool that relies on analytics to help discover the messages that need attention. Besides this, we’re also waiting to see IBM’s multimedia and instant messaging collaboration tool, expected by Domino shops who just don’t want to be left behind by Slack or Microsoft Team users. Finally, we should mention the fact that there are actually way more features to be launched with this new version, including tablet support, Docker images, as well as telemetry readable by New Relic. All these can take Lotus Notes to the same level as many other modern applications. As for Domino 11, it’s expected to make its debut in 2019, promising to bring a low-code development environment, similar to what Oracle, Salesforce and ServiceNow are already doing. IB Systems USA, Florida’s sole IBM Lotus Foundations business partner, will be among the first to make use of the new and improved platform. Providing consulting services in IBM Lotus Notes and Domino technology since 1994, they can provide all the help you need to integrate the new version into your business.